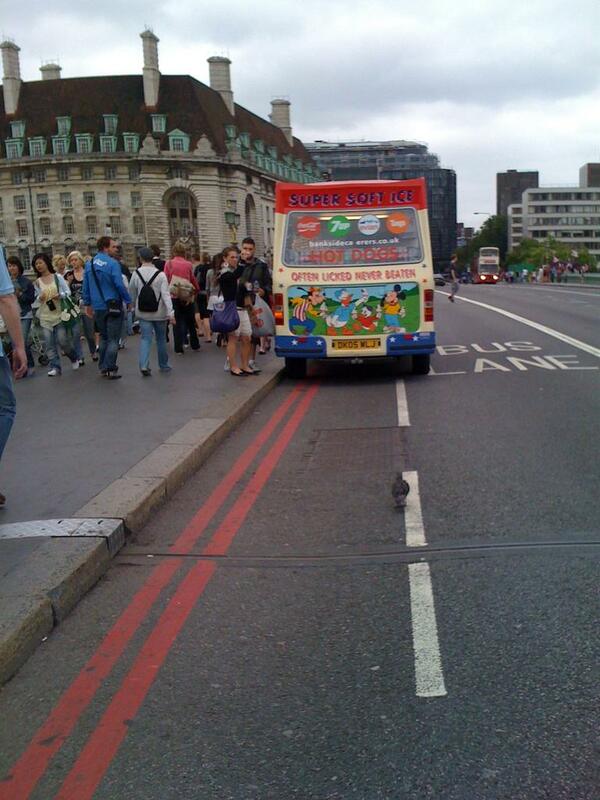 i b i k e l o n d o n: Is this the worse cycle lane in London? 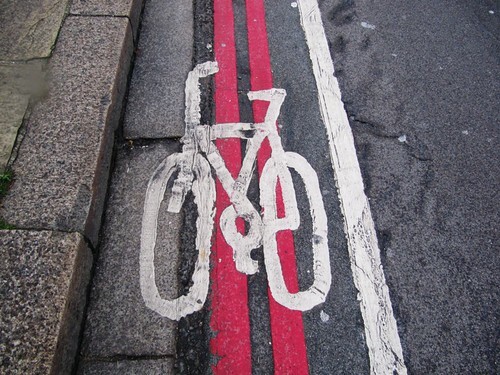 Is this the worse cycle lane in London? You'll often hear the argument from other cyclists that we should "be grateful for any cycling provision we get" or that cycle lanes that have been campaigned for have been "hard earnt", as if this means we should be silent in accepting them if they are second rate, or worse still dangerous. Unfortunately, there are many cycle lanes here in central London that are so second rate as to actually pose a danger to cyclists. 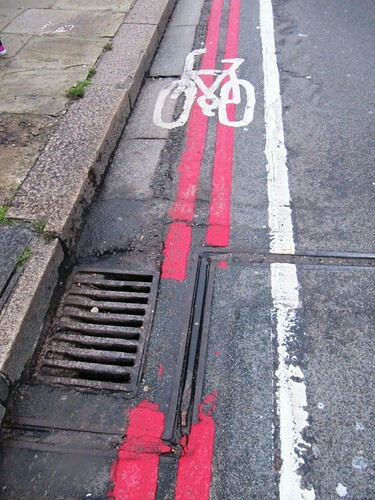 Defensive cycling means cycling at least three feet out from the curb, away from the gutters full of dirt and debris, away from the doors of parked cars that might open at any moment, away from the potholes and drains and, most importantly, out in the lane where you can maintain a straight predictable course (instead of weaving back and forth between gaps in parked cars) and where you can be seen by other road users. 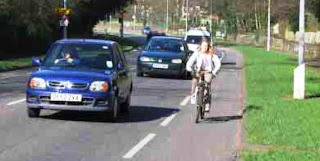 And when cyclists are wise enough to protect themselves by choosing not to use poorly designed cycling infrastructure, they are accused by motor users of not 'getting out of the way' and using the lanes provided (at great expense no doubt!). 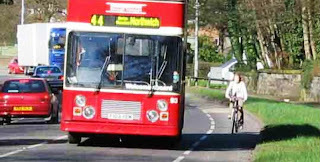 This only increases the animosity sometimes evident between cyclists and other road users. i cycle this bridge every day and never use the cycle lane because its so awful - i regularly have others drivers (especially taxis) shout at me to get in lane. Brilliant blog - so glad to have found you. Sadly I can't cycled at the moment (recovering arm injury) but this is making me itch to get back out there again. I am *so* bored of waiting for buses. Hello Cal, thanks for the post and welcome! I'm glad you found us too. Best of luck with recovering from that arm injury (not a cycling injury we hope?) and get back on that bike soon. No shortage of crappy bike lanes here in the States, either. Despite fighting a losing battle for more, I recently wrote our local Dept. of Transportation suggesting that one bike lane by my home be removed because it just isn't ridable anymore. But that certainly is one of the worst I've seen. And we have our problems with people parking in the bikes lanes, but here in L.A., it's usually a movie crew. Why do we need bike lanes at all? Cyclists in London seem to keep campaigning for them but as you note they encourage drivers to drive closer and think cyclists should get out of their way into the lane. Research shows they are more dangerous than not being there. So why waste all the campaigning effort and Council money to get something that doesn't work? I also cycle across this bridge most days. It is a complete death trap. The buses using the Bus Lane alongside the cycle lane seem to think it's acceptable to drive with their tyres on the thick white line that divides them. And if you can avoid the buses you have the bridge expander spaces to deal with - which just happen to be the perfect size for my bike wheels! The irony is that it's actually not that busy on the bridge but I seem to have more scary moments there than anywhere else I regularly cycle. Hi Natalie, thanks for the comment. I'm not surprised that this part of your journey is the most dramatic - the cycle lane truly is worse than useless. If I were you I'd pretend it wasn't even there and take the lane. Thanks for stopping by, and I love the tea blog by the way!